"Germantown tests best in Tennessee in every TNReady subject"
August 30, 2017—Germantown, TN—Germantown Municipal School District is proud of our student performance on the 2017 High School End of Course (EOC) Assessments. An article released this morning by the Commercial Appeal exclaims, "Germantown tests best in Tennessee in every TNReady subject". "Germantown Municipal Schools has a focus of improvement along with high achievement. Not only are we in the 100% percentile for performance, but we have also seen significant growth from 2016 to 2017," said Superintendent Jason Manuel. The district's State Percentile Ranking in each area improved from the previous year. In both High School English and High School Math, Germantown Municipal students scored higher than 100% of districts in Tennessee. Please see chart below comparing performance from 2016 to 2017. “Increasing student performance on state assessments is a testament to the hard work of our teachers, administration, and district staff. We believe that we are maximizing student potential and developing students that are college and career ready,” continued Manuel. Students listen intently in Michael Robinson's AP Human Geography class. •	Significant improvement for on track/mastery was made in ALL 9 subject areas. •	Double-digit gains were attained in ALL subject areas. Additionally, in a statement released by the Tennessee Department of Education, Germantown received some praise for reducing the percentage of students performing below course expectations—demonstrating that our students are growing at every level. 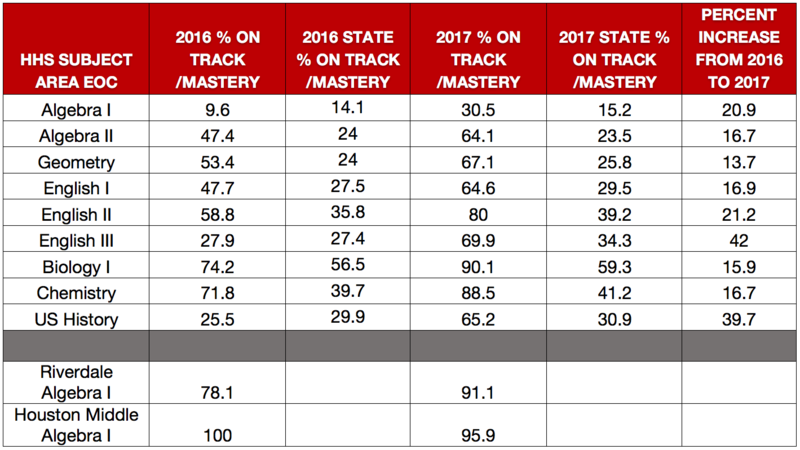 “On the majority of the end-of-course exams, Germantown Municipal School District out performed all other districts in the percentage of students performing in the on track and mastered categories."